As many of you know, last year I earned the privilege of parenthood after giving birth to my first child. What you may not have been aware of… I also birthed my digital baby: How2 Social – a social education and mentoring platform. My intent: Give everyone, no matter what their current skill set online, the opportunity to social with confidence. In the year since, I have been splitting parenting duties between my now toddler and evolving the How2Social business concept while also setting myself the task of getting down and dirty in the back end of the build. Admittedly, it has taken me a lot longer to get to this point than I originally thought it would, but that in itself has been an invaluable learning for me as well! Think of it as a concierge for social. Built for the express purpose of enabling people of all ages and ability in and around social and digital media technology. The Art of Social Parenting – the parents and guardian’s toolkit for managing their digital families. Social Business – for small and large organisations developing / refining their social communications. Social Me – for individuals developing your personal brand online. Social Sports – the pro athletes and coaches toolkit for building value through social communications. Each of them are umbrella programs for an array of content specific, social media enabling, practical How2guides with the added and personalised benefit of a dedicated mentor to help you build your skill and confidence while building your brand for personal and/ or professional use. It was important to me to develop a quality and individualised solution for people to learn and evolve their skill set in a ‘safe place’. That’s why at How2Social we don’t mass produce solutions. Each program is specifically tailored to the individual and very specific needs of members wherever they find themselves on the journey that is social. Membership is free and the programs are intentionally affordable. When you have a moment, please visit www.how2social.com and if I can assist you in anyway, please don’t hesitate to let me know. Additionally, if you know anyone who would benefit from How2Social education products and mentoring services, then please forward them my details and ask them to contact me directly. Thank you so much for taking the time to be here with me and celebrate the latest stage of my social technology journey. I am very grateful for your continued support. Earlier in the week I received an inmail via LinkedIn from the overachieving Mr Paul McCarthy, letting me know his new book, Online Gravity had been released. Very generously, he forwarded a copy via post. I first met Paul at a social media conference we were both presenting at last year and I was suitably excited for him. Last night, before heading off into the land of nod, I thought I’d have a quick look through the newest arrival to my bedside reading collection. This would soon prove possibly the most enjoyable mistake I’ve made in a long time. Online Gravity is proof red bull now comes in paperback. After flying through the first couple of chapters, my eyes were closed for less than 20 minutes before my brain sparked its first ‘must write down’ idea. Wrestling out of bed and into the office to ‘brainstorm’ said idea, attempts to return to bed proved futile. Paul McCarthy’s concept of the phenomenon of Online Gravity – an invisible force driving development (form and behaviour) in the age of the internet (online world) – is brilliant in its simple logic. Online Gravity – the book, demonstrates what the phenomenon does, how it develops and how it can be harnessed by individuals. It marries the science of the universe, technology and business in easily digestible chunks – that makes you want to keep reading, to keep questioning and in consequence promotes deep and diverse, critical thinking. With the unprecedented rates of change expected in global business structures, processes and workforce in the next five years thanks to digital ubiquity and the Internet of Things, Online Gravity is a tool every good educator should want to share with their students today to prepare them for a more evolved and much changed tomorrow. While I still have a couple of pages left to read (full review to follow in due course), what I do know is Online Gravity should be on every digital media, communications and business syllabus. It is an articulate, accessible guiding text on what we as digitally dependent individuals and businesses can expect in terms of process and practice. While articulating as a workforce, how best to harness the phenomenon of online gravity. It is what true thought leadership looks like on paper and in practice. As someone who has been struggling with refining my PhD research question (just part of the joy of the process so I’m told), thought leadership such as Online Gravity motivates this humble researcher to stretch beyond convention in articulating the synergies and antagonisms of the new social business frontier and beyond. As the principal mentor at How2Social.com, Online Gravity feels like a supportive hug as I jump off the new business precipice, confident in my ‘hunch’ of the ever-present need for and cultural importance of proactively enabling humans in and around new social and digital technologies. Thank you Mr McCarthy for sharing the phenomenal read that is Online Gravity! 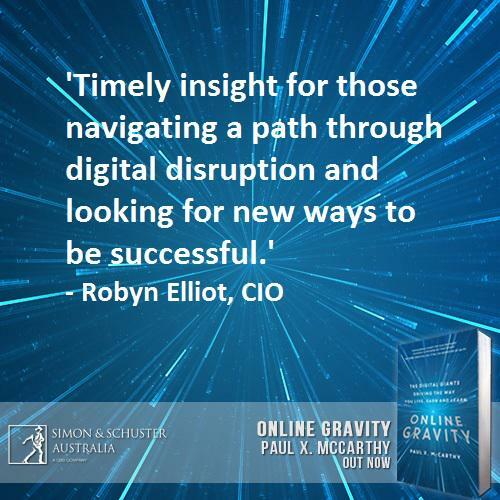 Online Gravity is published by Simon & Schuster Australia and is available in paperback ($32.99) and e-book($17.99) formats. Australia: Dymocks, Booktopia, Bookworld, Collins, Readings, Better Read than Dead and QBD. UK: Amazon UK, The Guardian Bookshop, Foyles, Waterstones, WHSmith. Super Bowl advertising is expensive and represents some of the best known ‘spots’ in global advertising. Traditionally, it is the best cocktail of TV and outdoor that has the power (audience) and prestige (position) to make or break a brand, but cash alone (approx. USD 3.5 million for 15 second spot) does not guarantee position. That comes down to creative (and relationships). With Super Bowl kicking off in the wee hours of Monday morning (Sydney, Australia time), Super Bowl creative is top of mind in corporate and creative circles around the world. This year, Visa declined a spot in favour of social, while Kia and Budweiser have put together some key spots. Although, Mercedes inspite of the the use of fire, not so hot. And while fellow automotive VW creative was controversial, GoDaddy.com ‘s shock and awe tactics won out, by pairing a Sports Illustrated Swimsuit model and nerdy computer type in a raunchy game of tonsil tennis. Samsung, put a fresh spin on the use of celebrity ambassadors, as Coca-Cola raised the engagement stakes for gamification, but potentially at the cost of the creative. While also highlighting why Super Bowl ads are not always broadcast outside of the USA, with this gem. Anyone else thinking Bundy? While Doritos reverts to its original point of (campaign) origin for Super Bowl creative: story-telling by an amateur creative and Doritos Crash the Super Bowl competition winner, Pizza Hut keeps it simple in a fabulously contextually relevant way. When it comes to ad creative EVERYONE has an opinion. Talk Super Bowl and quite frankly, it doesn’t get much bigger. But as with all marketing communications, what works, and what doesn’t is personal. So what works for you this Super Bowl final advertising season? And most importantly, Why? A commonly posed question, worthy of a universal and definitive answer. However, media is not always comprehensively or easily defined. Research would suggest that the context of definition, significantly impacts how the term media is defined. For instance, a public relations practitioner will group various mass and niche communications technologies and businesses into ‘target media channels’. Whereas an advertiser and media planner will define ‘media types or categories’, such as print, broadcast, outdoor, online, with a view to creating target channels for campaigns. But how can you define a term by using a term? I guess it comes down to whether it is a noun or an adjective. These are just some of the definitions proposed for media. Which one do you think is best? These aren’t academic explanations, obviously, but they are invaluable for students new to the study of media. Because a quick google/ online search enables students to ask the most basic of questions and potentially find an answer that enables them to access the concept and look for further content. I encourage all of my students to start at the very beginning. Break down the keywords in any question or assigned task and ‘enter’ the project as comfortably as they can. What is the difference between traditional, new and online media? The internet, HTML: a Western invention? In discussing Jacques Derrida’s theories on the process and impact of writing on texts, in the greater debate of textuality, I couldn’t help but be drawn into thoughts on production and consumption, more specifically, the production of the internet and the world wide web as western technologies. Chinese students generously sharing and taking the time to explain what is ultimately a convoluted and time consuming process of creating text online via two different systems in order to replicate (via a chosen software) and produce, edit and consume in the western sense. I had never thought of the internet as a western text, until now. Which begs the question, what does the eastern version look like and what could we learn from it if granted access?